I review the state of marine biology in South Africa within my personal perspective on science and its role in society. The argument is often made that, given free rein, science can serendipitously produce new understandings, techniques or concepts that will have direct value to society. This argument is clearly true, but equally important is the idea that good science, like high art, is a hallmark of civilisation. Many, perhaps all, of the major civilisations of the past were characterised by strength in some aspect of science: Aristotle's categorisation of the natural world, Arab mathematics, Roman engineering or Mayan astronomy. So I believe that any society that aspires to being civilised should encourage the sciences, not only for their usefulness, but, like the arts, also for their own sake. Of course, most societies put many more resources into science than the arts, so it is reasonable for society to steer science in directions that it considers valuable. The danger is of going too far and allowing the state to dictate not only what science should be practised, but how it should be practised and in extreme cases even how it should be interpreted. The classic example would be Trofim Lysenko who, by forcing Soviet genetics to conform to Marxist ideology, effectively destroyed the discipline, with profound economic consequences.1 Without suggesting that this has been the case in South Africa, it is clear that marine biology in South Africa has been strongly shaped by politics over many decades. This creates both advantages and threats. Scientific independence from Europe began with the establishment and growth of scientific institutions in the 20th century. The Division of Sea Fisheries was established in 1929, the South African Association for Marine Biological Research in 1952, the South African National Committee on Oceanographic Research in 1956 and the JLB Smith Institute in 1968.2 Marine research programmes also developed at universities, which have their own dynamics and are both constrained and unconstrained in very different ways from other organisations, especially government institutions. Today, South Africa is a driving force in marine biology for the entire African continent. 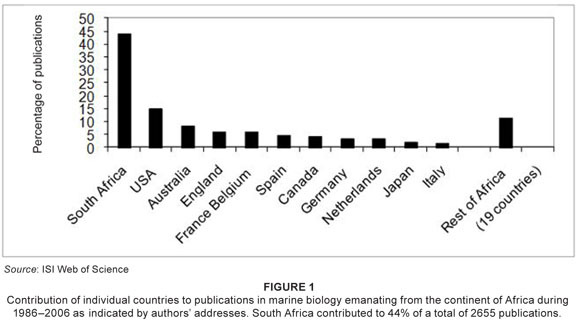 South African scientists have contributed to more than 40% of all papers on marine biology in Africa during the last 20 years (Figure 1). Most of the remaining papers came from countries on other continents  North America, Australia and Europe  while the rest of Africa combined was involved in just 12% of these scientific publications. Being the major force behind marine biology within the continent carries obligations as well as kudos. Perhaps the most persistent threat to marine biology in South Africa has been regionalism, with an enormous emphasis on the Western Cape.6 Regionalism is important because the various coasts of the country are physically different, are influenced by different current systems and support biological communities that are as different as the fynbos and the Karoo biomes. Yet an emphasis on the west coast has channelled a huge proportion of our research efforts into a single biogeographic region. This is understandable given the history of the discipline and the fact that the bulk of the country's commercial fish catches are taken on the west coast.7 It also derives from a highly successful partnership between the University of Cape Town (UCT) and Marine and Coastal Management (MCM) dating from 1907 when John Gilchrist was both Professor of Zoology at the South African College (later UCT) and Government Marine Biologist, employed by the Department of Agriculture.8 The high point of this partnership came with the Benguela Ecology Programme, which ran for three consecutive five-year cycles and laid the foundation for South African participation in the Benguela Current Large Marine Ecosystem programme.9 This focus on the west coast absorbed a major proportion of research funds over this prolonged period and came at the expense of other regions. The importance of regionalism is not limited to finances and resources. In 1977, John Day10 produced a survey of marine research in South Africa that closely resembles the situation today. Different areas of expertise and research foci exist in different parts of the country. This differentiation reflects the small size of our research community and the fact that different ecosystems predominate in different places. But it also indicates a systems-or taxon-based approach by many, or perhaps most, of our marine scientists, which could be considered to be one of our major weaknesses. Overall, we do not use our marine expertise to answer fundamental questions in biology. To address fundamental questions, we should focus on broader, less parochial questions. Firstly, I need to address the idea that there is no difference between applied and fundamental research, only between good and bad research. There is no doubt that applied research can be good research and fundamental research can be bad, but there are some major differences between the two (Box 1). In the case of ecology particularly, the questions addressing applied problems are often site-or system-specific, making it more difficult to produce generalisations with wide interest that contribute to theory. During the late apartheid era the government invested considerable efforts in promoting science to escape an academic boycott of the country. More importantly, the major government funding agency, the Foundation for Research Development (today's National Research Foundation or NRF) took what was described as the 'hero approach'. Basically, a rating system was used to identify scientists of high stature and track record was seen as the best predictor of future performance. Funding was closely linked to ratings and the direction of research was left to the discretion of the grantholder. With the political re-alignment that followed the country's first democratic elections there was a change in emphasis, with a widely held perception that science should contribute directly to the welfare of society. Inevitably this has meant a leaning towards applied research. On the whole the marine biologists bought into this approach while within government it became virtually non-negotiable. The most dramatic example came from the redirection of the government's Sea Fisheries Research Institute. This redirection stemmed from a perception that the government arm for dealing with marine resources should be dedicated solely to their management. This department was renamed Marine and Coastal Management (MCM) to emphasise this change in direction. The change led to the haemorrhaging of research capacity and the need for MCM to begin outsourcing research. This shift to applied research and management reflected not only the sincere convictions of some marine biologists, but also their concerns over the likelihood of obtaining funding. Today, for example, few grant applications do not include the words 'climate change' or 'biodiversity'. There continues to be an attempt to direct research, which is the antithesis of the FRD's 'hero' approach. A recent (2009) call for funding applications for the SEAChange Programme13 placed enormous emphasis on issues of governance and stated: 'Funding will be allocated on a competitive basis but will take cognisance of .....redressing the imbalance in terms of race, gender and age of researchers.' In other words, decisions on financial support emphasise political as well as scientific criteria. In most South African universities, staff within marine biology are extremely 'thin on the ground', in some cases limited to a single staff member, and the discipline must compete with all others when new appointments are made. Of course, those staff members have other duties, particularly teaching. This is why a shift from research at the Sea Fisheries Research Institute to management at Marine and Coastal Management is such a blow to marine science. This organisation includes the largest concentration of marine scientists in the country and there has been a deliberate policy decision to move from research to management. Likewise, the Oceanographic Research Institute in Durban (ORI) 'conducts marine research of an applied and problem solving nature...' 14 and its publication list for 2008 15 includes five papers in scientific journals (three in South African journals), a South Africa Association for Marine Biological Research special publication, unpublished reports, nine data reports and a host of popular articles, technical reports and external reports. Although the staff at ORI are working extremely hard, the focus of the organisation is clearly not on generating primary scientific literature. That is obviously a strategic decision made by the organisation that I cannot argue with, but given that ORI is another of the larger concentrations of marine scientists in the country, I cannot help regretting it. The potential within ORI, MCM and other non-university institutes for a direct contribution to marine science is huge as they employ most of the marine biologists in the country. 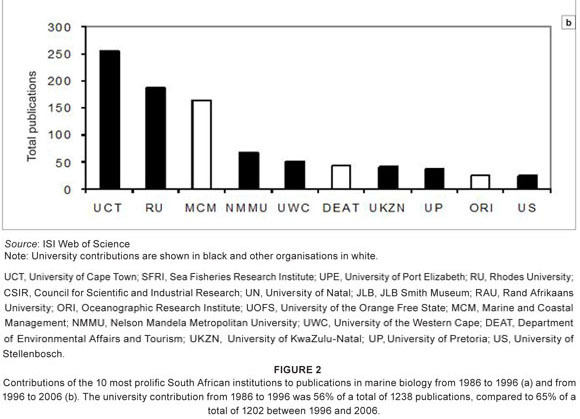 Yet the bulk of peer-reviewed marine science published from South Africa comes from the universities and the proportion they contribute is growing (Figure 2). Here, we should remember that the universities have a mandate to carry out research, but not necessarily in marine biology. In this context, designated groups signified Black, female and disabled people. This policy seeks to make it virtually impossible to hire White men. I understand the argument for this approach, though I find it morally unacceptable to discriminate among people on the basis of their race or gender. However, pragmatically, to appoint people to teaching positions on the basis of criteria other than their ability to teach is detrimental to the individuals concerned, to the institutions in which they work (including the students they will teach) and to society as a whole. This policy would also make it virtually impossible to employ foreigners. Setting ethical views aside, in a country that bemoans the loss of skills in a world in which skilled people are highly sought after, this is madness. Yet it reflects a response to political imperatives and indeed legal requirements. Faced with a similar skills shortage in the 1940s, the apartheid Nationalist government took exactly the opposite approach and implemented strategies to attract foreign scientists, not to exclude them.2 Of course those scientists had to be White, which I find equally unacceptable. Fortunately, there have been recent developments that point to a re-balancing between fundamental and applied research. For example, there are two new South African Earth Observation Network nodes that are directly concerned with marine biology. The DST-NRF funded centres of excellence and research chairs are a critical strategy to try to address this re-balancing. Although two of the existing centres have only a peripheral connection to marine biology (one concerned primarily with 'Invasion Biology' at Stellenbosch University and one focusing on 'Birds as Keys to Biodiversity Conservation' at UCT), the newest centre, The African Centre for Climate and Earth Systems Studies, also located in the Western Cape, should have a much greater emphasis on the marine domain. Two of the research chairs directly concern marine biology, one at the University of Cape Town and one at Rhodes University. These chairs are interesting because in a sense they 'hedged their bets'. The chair at UCT is in Marine Ecology and Fisheries (italics added). The pre-proposal at Rhodes named the chair in Marine Ecosystems and Resources because there was a strong belief that without the word 'resources' the application wouldn't be successful. It was an act of faith to change that name to Marine Ecosystem Research. These are very encouraging developments, though unfortunately, even with the chairs and centres, there is yet again an almost total focus on the Western Cape. Lastly, there is the promise of a new research vessel to replace the SA Agulhas which has long since passed its sell-by date. This is closely linked to discussions about a strategy to create a new Institute of Marine and Polar Research. Are the marine biologists doing better science than 20 years ago? Quantitatively there has been a dip (Figure 3). Although the trend may now be upwards again, this remains alarming given the exponential increase in scientific publication rates globally. Most institutions published fewer papers in 19962006 than in the previous 10 years (Figures 2A and 2B) and the contribution of the universities to the nation's outputs grew from 56% to 65%. There remains a disconcerting dependence on the South African Journal of Marine Science (now the African Journal of Marine Science), which accounted for nearly 33% of all publications in 19861996 and 32% in 19962006.17 This is a very respectable journal but such heavy reliance on a single journal that is in essence a South African product can be seen as a weakness. There are other serious weaknesses in our system. Mark Gibbons at the University of the Western Cape recently completed a review of publishing trends in marine biology for 20012006.18 Although almost 70% of our outputs were published internationally, only a tiny fraction of articles were published in non-marine journals. I agree with Gibbons' interpretation that this is a sign that we need to address broader questions that are of interest to non-marine scientists. There is also a definite bias towards organisms that are directly exploited as resources, or are indicators of ecosystem health. Both these points indicate the continued predominance of applied research. As was the case 20 years ago,19 the vast bulk of research outputs are produced by a small cadre of productive individuals with many marine biologists publishing little or nothing. Gibbons's finding was that 36 people produced more than 50% of all outputs, yet the triennial Marine Science Symposium will normally attract more than 300 delegates. Of course, this pattern may well apply to other disciplines and in other countries. Here we blend seamlessly into more overtly political issues. Gibbons found that 95% of these 36 people are male and 97% are White. This issue is often raised in the context of a problem, and clearly it is a problem because it means that as a scientific community we are not reaching our full potential. This situation is often subliminally, or even overtly, portrayed as a problem of White men benefiting from hidden biases in society. An alternative view is that we need to find ways of developing a culture of research and publication among the other demographic groups. Overall, as for 20 years ago, research outputs from the discipline are dominated by a handful of individuals, different types of science are practised in different parts of the country, regionalism prevails and there is still too little collaboration across the country. But there have been steps forward. There are good examples of inter-institutional collaboration, particularly in the area of ship-based research, though logistic and technical support for this is precarious at best. While still all too rare, cross-disciplinary collaborations are also beginning to emerge and there has been a burgeoning of international initiatives. Perhaps most encouraging, has been a tightening of rigour in our approach to how we do science with an increasing emphasis on experimental design and statistical analysis. In the realm of conceptual breakthroughs or theoretical advances, however, the picture is less rosy and overall productivity has decreased relative to other disciplines within the country. Ranked solely by productivity, marine biology has slipped from 11th position in 1986 and a high point of 4th in 1993 to 18th in 2006 (Figure 4). This is not an encouraging trajectory. The discipline of marine biology has been buffeted by the competing winds of science and politics. The focused attempt to promote science, including marine biology, under the apartheid regime was politically motivated. After 1994 the shift to an emphasis on science with direct relevance to society reflected changing political philosophies. The many opportunities that arose after 1994 for collaboration with other countries and for international funding reflect an obvious political consequence of the country's first democratic elections. The outpouring of funds for Antarctic and Southern Ocean research in the mid to late 1990s was a direct political response to the imminent ratification of the Antarctic Treaty, as was the withdrawal of those funds that quickly followed the ratification. So there can be no doubt that marine biology, perhaps like all branches of science, has been and will probably continue to be powerfully influenced by politics. This has advantages and disadvantages, but there is no question that our science is very finely balanced between scientific excitement and opportunity on one side and political baggage on the other. Given that South Africa provides the major input to marine biology in Africa and that the relative contribution of the universities to the discipline within South Africa has increased dramatically, any weakening in universities has continent-wide implications and should be viewed with serious concern. Africa has a huge coastline that supports both artisanal and commercial fisheries; the coastline has a key role in many of these African countries. The coast has a central place in their economics through food production, by providing ecotourism potential and by providing much of their biodiversity. South Africa is also perfectly placed as the African gateway to Antarctica and the Southern Ocean, which are intimately linked to global climate change. For me, it is also important that South Africa should aspire to being a nation that values science for its own sake as a critical hallmark of human endeavour. If Africa as a continent is not only to deal with its own immediate problems, but also to make a meaningful contribution to the realm of science, we need to attract, train and retain as much talent as possible and to encourage the pursuit of fundamental research at our universities. This article is based on an invited keynote talk at the annual symposium of the Zoological Society of Southern Africa. I am very grateful to several colleagues for comments on an early draft. This work is based upon research supported by the South African Research Chairs Initiative of the Department of Science and Technology and the National Research Foundation. This support is gratefully acknowledged. 16. Rhodes University. Senate document 7 March 2008  document number: S-2008.2. Item number: 2008.2.08 (3.2). [Unpublished] [ Links ].